PENCILLERS: Franco Urru, Andy Kuhn, Valerio Schiti, Ross Campbell. Cover by David Peterson. As a child of the ’80s, there are few books I’m enjoying more than IDW’s Teenage Mutant Ninja Turtles, which combines elements from the nearly all incarnations of the TMNT. In addition to the monthly ongoing series, IDW is publishing several Micro-Series issues which run alongside the events of the book. Each issue spotlights a single character, and provides some extra insight as to how their minds work. This book collects the first four Micro-Series issues, each of which focuses on one of the boys in green. This book is a little tough to get a grip on because each issue takes place at a different point in the story being told in the ongoing TMNT series, with different locations and different characters. From a collection standpoint, I find it a little odd that these issues weren’t collected with Tom Waltz and Dan Duncan’s TMNT issues, so the story could be told in a less confusing, more linear fashion. I suppose it offers an advantage in that the fluctuating artwork lends itself to the different perspectives of the characters. But including these issues with the ongoing story might have increased their level of exposure, as this material really isn’t necessary for the enjoyment of the regular series. Raphael is up first, in what is probably the most notable issue here. Shortly after Raph is reunited with his brothers in Change is Constant, he and Casey Jones are out on patrol. They run into a humanoid arctic fox named Alopex, who initially portrays herself as the victim of a bizarre experiment. But eventually we learn that’s not quite the case. In addition to the debut of our mildly sexualized mutant snow fox here, we also see a pair of familiar looking cretins: Bebop and Rocksteady in human form. This obviously indicates that we’ll be seeing the return of the beloved dimwitted duo in the near future. We also get a brief look at their boss…three guesses who that is. 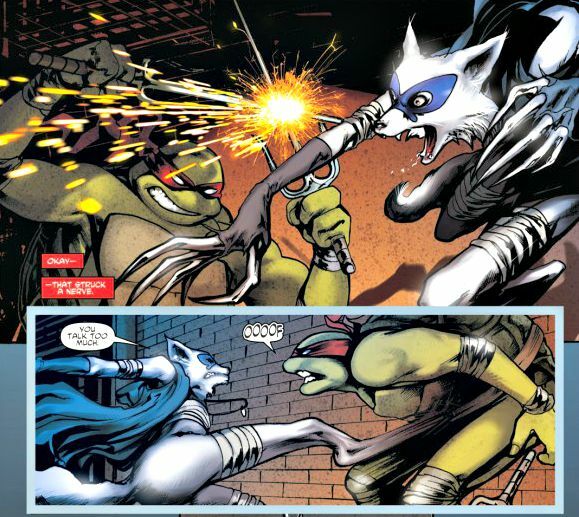 My biggest complaint with Raph’s part of the book is that the debut of Alopex and the return of Bebop and Rocksteady steal the spotlight from him. The story is supposed to be about how he has a sentimental side despite his tough exterior. But that’s not what we come away thinking about. It’s a strong issue, but maybe not for the reasons it wanted to be. Next we go to Michelangelo, who’s out to have some fun on New Year’s Eve, but stumbles on to a heist. What’s cool about this issue is that it really plays up Mike’s individuality, and his desire to have fun like a normal teenager would. Instead of constantly running drills like Leo, training like Raph, or tinkering with machines like Don, he wants to live his life a little more. This story tells us there’s really nothing wrong with that kind of individuality, and we see Mike realize that the only person (or Turtle, I guess) that he needs to be to find success is himself. Andy Kuhn’s art isn’t normally the type I would enjoy on a Ninja Turtles story. But given Mike’s light-hearted demeanor, it works here. We then move to Donatello. A lot of writers tend to let Don’s role as “the brain” eclipse any other potentially interesting aspect of his personality. That’s not the case here. Brian Lynch and Tom Waltz (who actually wrote the script here) portray Donny as someone whose interests often isolate him from his brothers, who don’t share them at all. He finds some camaraderie and companionship through the anonymity of the internet, where he finds out about a gadget convention and decides to attend. When he finds Baxter Stockman causing trouble, Don and his “internet arch enemy” have to save the day. Valerio Schiti’s art really stands out in this book, as it’s the cleanest and most stripped down compared to the rest. I like the way the internet is used in this story and how Don, like a lot of people, used it as a way to reach out and express himself in ways he can’t at home. It added a new level of depth to his character that I haven’t seen explored before. The most emotional story in this collection belongs to Leonardo. The issue takes place shortly after Splinter is kidnapped by Old Hob. 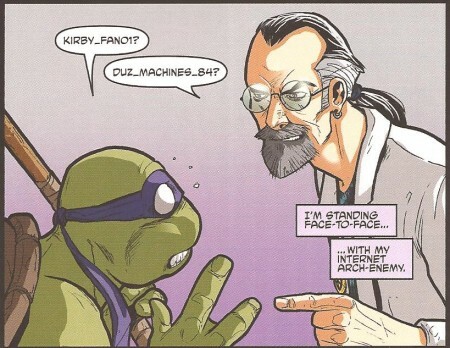 Now, much like we saw in the original Kevin Eastman/Peter Laird issues, the Turtles must find their lost father. While searching for Splinter, Leo is attacked by countless Foot soldiers (yet another echo from Eastman and Laird), and must fight to survive. As he’s fighting, he flashes back to his childhood, and recalls his mother’s murder at the hands of Oroku Saki (Remember, in this continuity the Turtles and Splinter were originally human before being murdered by the Foot Clan, and reincarnated in their mutant form). As such, Leo snaps and we get a bit of insight as to why he’s so dedicated to his family and his training. Ross Campbell’s Turtles are shorter and more stout than what we’re used to seeing from Dan Duncan. But the style works well in its own right. 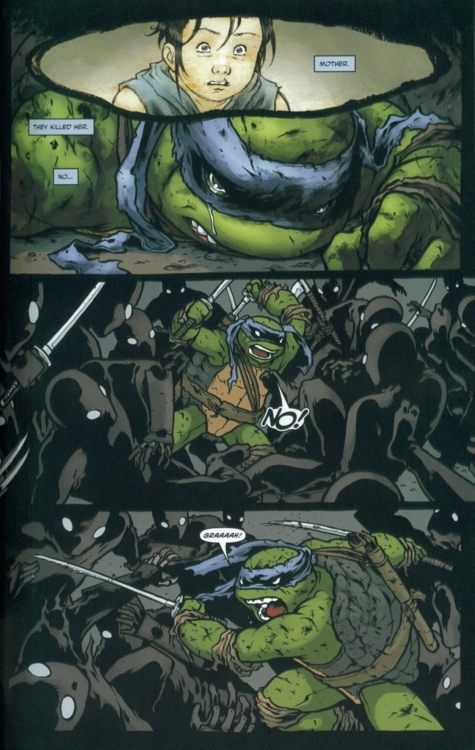 During a few key moments he even diverts from the use of white slits for the Turtles’ eyes in order to give Leo a bit more of an expressive face. The fight between Leo and the Foot is also really suspenseful and well choreographed. It really builds to a fever pitch, making for a sequence fitting for the Turtles’ best fighter. The book also has a few nice nods to the ’80s cartoon that I really enjoyed as a longtime fan. Mike calls himself a “party dude,” Don’s screen name is duz_machines_84. Little things like that are fun. While this book is frustrating in how it picks up at various points in the ongoing series, the character development it provides for Leo, Don and Mike is undeniable. Raph didn’t necessarily have a moment like that, but given the extra of attention he always seems to get compared to the others, he’ll survive. If you’ve ever given the Turtles as individuals this much thought, you’ll enjoy this book. Images 1 and 2 from 4letter.net. Image 3 from thetechnodrome.com. This entry was posted in Comic Books/Graphic Novels and tagged Alopex, Andy Kuhn, Baxter Stockman, Brian Lynch, Casey Jones, comic book reviews, comic books, comics, David Peterson, Donatello (TMNT), Franco Urru, IDW Publishing, Leonardo (TMNT), Michelangelo (TMNT), Raphael (TMNT), Rob Siebert, Ross Campbell, Teenage Mutant Ninja Turtles, Teenage Mutant Ninja Turtles (IDW), Teenage Mutant Ninja Turtles Micro-Series Vol. 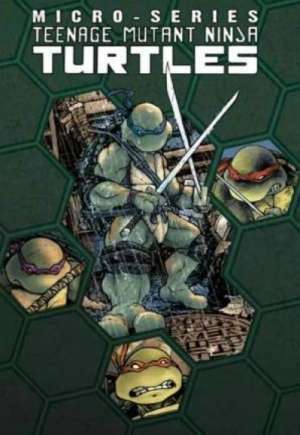 1, TMNT, Tom Waltz, trade paperback reviews, Valerio Schiti on 06/21/2012 by primaryignition.